Ugh, there's nothing we hate more than pants that don't fit quite right. It's right up there with loving a look but knowing that something's missing. Well, don't fret. We found the solution to both of these problems. A proper belt. Save your pants from the terror that is the floor with a Black Vinyl 2 inch Belt. It's the perfect way to keep them safe at your waist, no higher or lower. Don't thank us, thank the belt! If you've ever had a Halloween costume that you loved, but was a little too big around the waist, this belt will be a costume saver. 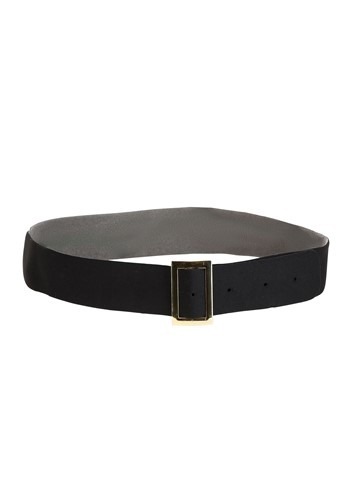 This vinyl belt measures 2" wide and fits up to a 42" waist. It's got a metal buckle so you know it will hold up to use. Every costume deserves the final touches, and this belt is an inexpensive way to add those final details to your Halloween costume this year. Whether you are wearing a Santa Claus costume or a baseball player costume, a black vinyl belt can take your look to the next level!